The Andes, Fauna and Nature, Part 3: Patagonia. 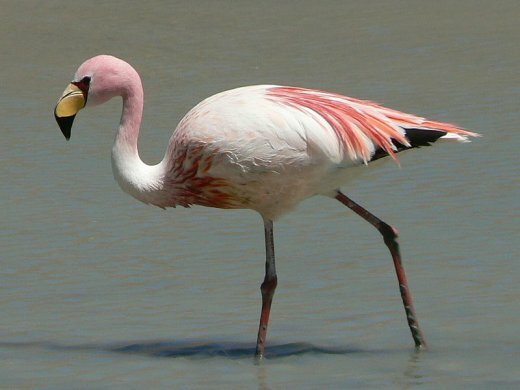 Puna Flamingo, Phoenicoparrus jamesi . .
Parque Nacional Los Glaciares, Argentina. 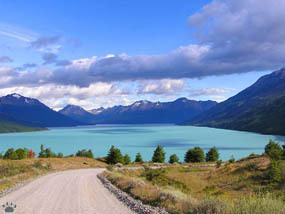 Andes of Patagonia are virtually uninhabited. The highest mountains are covered with extensive icefields. In the far south, the mountains continue to Tierra del Fuego and the Scotia Arc. 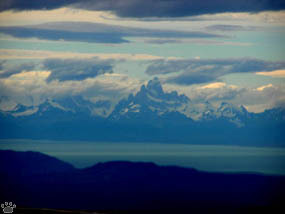 Views of Cerro Fitzroy, PN Los Glaciares, Argentina. lakes. The southern part of that area is the most scenic. long and weigh 2.73.2 kilograms. They are found in open grasslands. Farmers look at those birds as a pest, and kill them in great numbers, still they remain numerous. 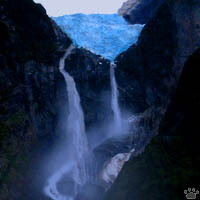 Perito Moreno in PN Los Glaciares is now the most visited glacier in South America. 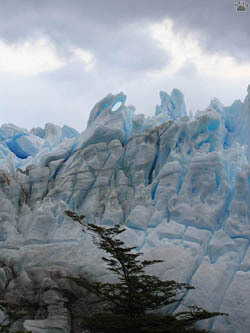 Perito Moreno Glacier in bad weather. Perito Moreno Glacier in good weather. This glacier is easily accessible. It's also very active. 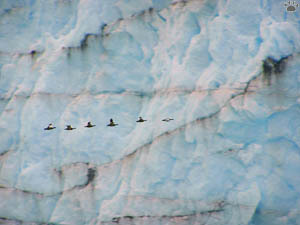 Small-scale calving can usually be seen every hour or two; larger icebergs break off at least once a day. 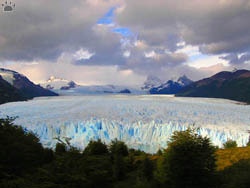 Perito Moreno Glacier flows from the South Patagonian Icefield. Alfa male guanaco on a lookout. 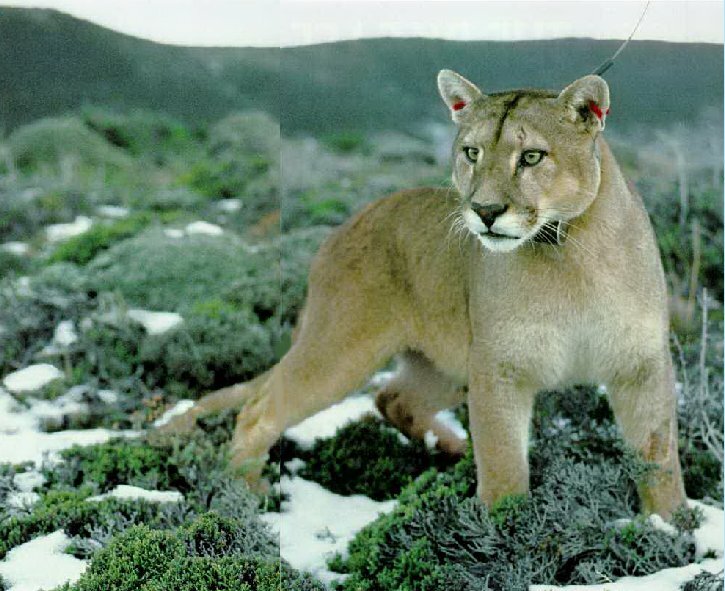 The Cougar, Felis concolor, is not an animal you should get too near, at least not on a hillside like this. mammal in the Western Hemisphere, extending from Yukon in Canada to the southern Andes of South America. the Western Hemisphere, after the jaguar. Notice the antenna on the left ear. Scientists are still trying to learn about this animal. Lamas, Guanoacos, foxes and many others. rocky areas for stalking, but it can also live in open areas. The cougar is territorial and persists at low population densities. Individual territory sizes depend on terrain, vegetation, and abundance of prey. people. Attacks on humans remain fairly rare, despite a recent increase in frequency. 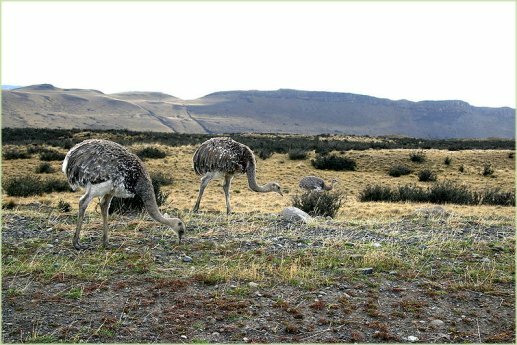 species of rheas. It is found in the Altiplano and Patagonia in South America. It stands at 90100 cm tall and weighs 1525 kg, and has larger wings than other ratites, enabling it to run particularly well. It can reach speeds of 60 km/h, enabling it to outrun predators. The sharp claws on the toes are effective weapons. 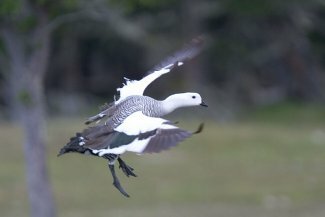 Their plumage is spotted brown and white, and the upper part of their tarsus is feathered. and later the chicks, eat these flies. The incubation period is 3044 days, and the clutch size is from 555 eggs. of from 5 to 30 birds, of both sexes and a variety of ages. 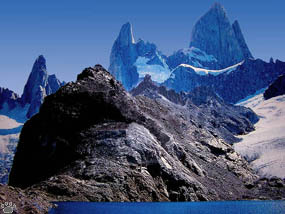 from 3,0004,500 m, but locally down to 1,500 m in the south. A guanaco, Lama guanicoe, is being borned, with legs first. American language Quechua word wanaku (old spelling, huanaco). 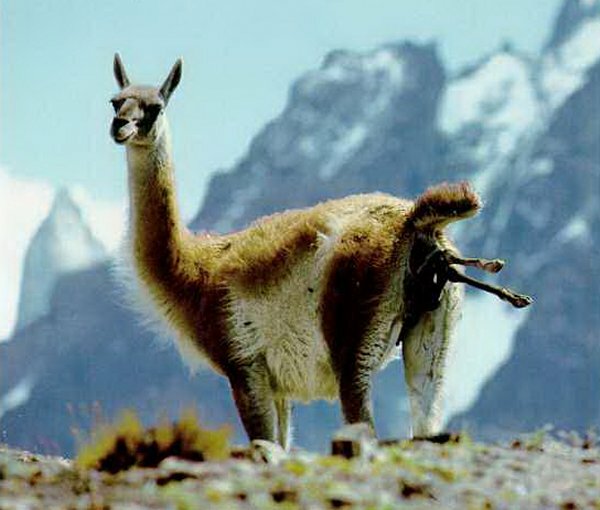 Young guanacos are called chulengo(s). them regain their population stability. A guanacos typical lifespan is 20 to 25 years. Estimates, as of 2011, place their numbers at 400,000 to 600,000. 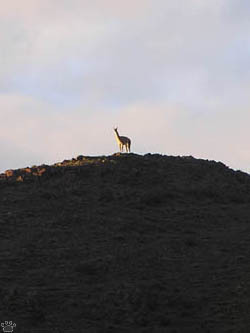 Guanaco live in herds composed of females, their young and a dominant male. Bachelor males form a separate herd. run behind the herd to defend them. They can run with a speed of 56 km per hour, often over steep and rocky terrain. the jaguar). . 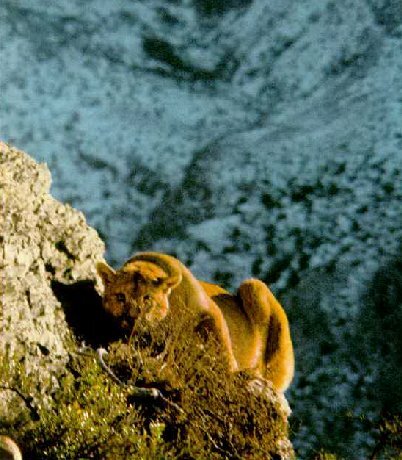 They have only one natural predator, the mountain lion. Guanacos will often spit when threatened. and pounding the skin to be used for the soles. of smell and good hearing, make them together a first class alarm-system. especially around small lakes. In winter some wildlife is easier to see, but the weather can be brutal. There are many shallow saltlakes up in the mountains. That is why most bird stay away from them. 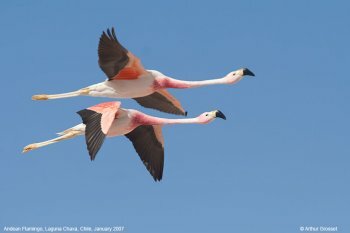 Chilean Flamingo, Flamenco chileno, (left) Note the grey legs with the red joints and feet. 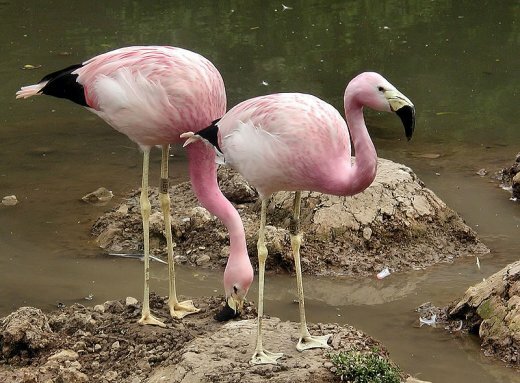 Compare with Andean Flamingo, Phoenicoparrus andinus, (right) with yellow feet. 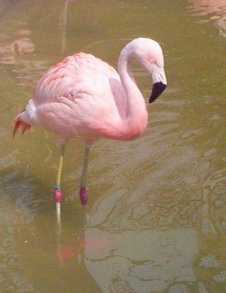 The Chilean Flamingo, Phoenicopterus chilensis, is a large species, 110130 cm. It breeds in temperate South America from Ecuador and Peru to Chile and Argentina and east to Brazil. Like all flamingos it lays a single chalky white egg on a mud mound. from these species by its greyish legs with pink "knees", and also by the larger amount of black on the bill (more than half). 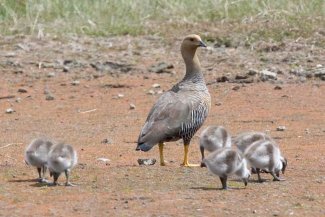 Young chicks may have no sign of pink coloring whatsoever, but instead remain grey. from the water of the coastal mudflats, estuaries, lagoons and salt lakes where it lives. When the salar is covered with water, three species of flamingo use it for nesting. 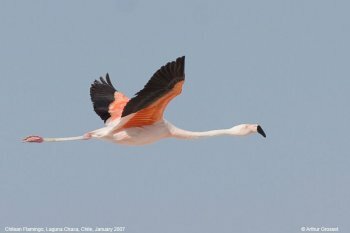 The most common is Chilean flamingo, found here in flocks of thousands. When the salar is dry, the flamingo flocks move elsewhere, but flocks of varying size can usually be found at smaller lakes nearby, especially at Salar de Coipasa to the north, a huge salt flat that always has water in the center. entire spectrum of available foods, from fish to invertebrates, from vascular plants to microscopic algae. at Slimbridge Wildfowl and Wetlands Centre, Gloucestershire, England. keeled bill; the upper jaw is narrower than the lower jaw and this creates a gape on the dorsal surface of the bill. 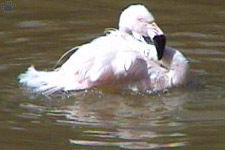 in the bill causing water to flow out of the mouth and leaving diatoms in the flamingos bill. 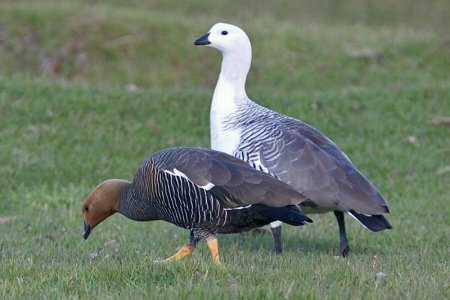 but it is thought to occur between the Chilean breeding grounds and the wetlands of central and western Argentina. and the bill is bright yellow with a black tip. and that ends up the Flamingos. 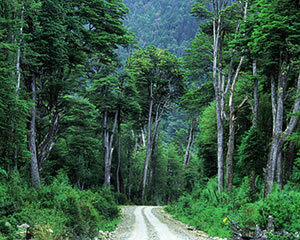 and channels, with slopes covered by dense temperate rainforests, mostly of southern beech (Notofagus). one of the most beautiful and remote highways in the world. Most of the region is now protected by a network of huge, very pristine National parks. name and directed by American Douglas Tomkins, offering beautiful trails through the extraordinary landscape of this region. This area has a lot of endemic plants, most of them survivors of ancient Antarctic flora. numerous rodents, and some little-known predators such as Patagonian weasel, Lyncodon patagonicus. 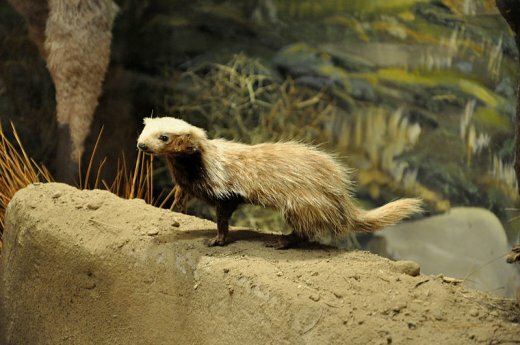 The Patagonian Weasel, Lyncodon patagonicus, is a small mustelid that is the only member of the genus Lyncodon. Journal of Syms Covington, who sailed with Charles Darwin on his epic voyage aboard the HMS Beagle. The Southern River Otter, Lontra provocax, is a species of otter that lives in Chile and Argentina. 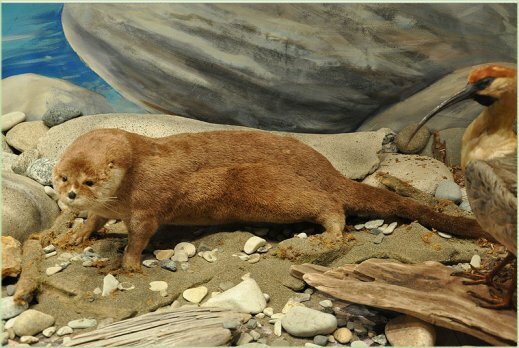 Although called a "river otter", it inhabits both marine and freshwater environments.This is a subspecies of Lontra canadensis. The southern river otter is listed as endangered, due to illegal hunting, water pollution, and habitat loss. at about 5-10 kg. Its skin is dark-brown on the top and has a lighter cinnamon color on its underside. two pups, but up to four can be born at a time. Their diet includes fish, crustaceans, mollusks, and birds. be present to use as cover. 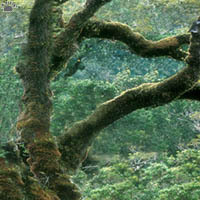 Their habitat also needs the root systems of mature trees, as well as fallen tree debris. 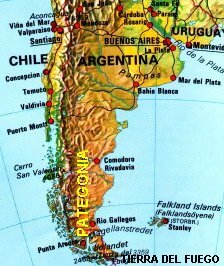 and southwestern Argentina; it is resident within its range. 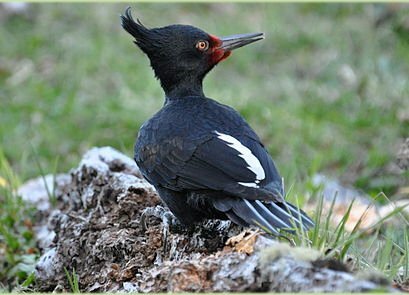 This species is the southern-most example of the genus Campephilus, which includes the famous Ivory-billed Woodpecker. 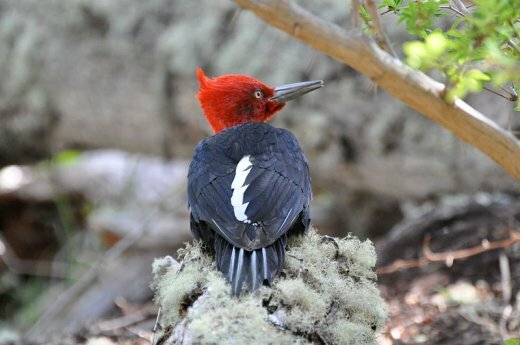 The Magellanic Woodpecker is 45 cm in length. Males of this species weigh 310-365 g, and females weigh 275-310 g.
They are the largest South American woodpeckers and one of the largest woodpeckers in the world (Black Woodpeckers and Great Slaty Woodpeckers are the only larger extant species). This species is mainly black, with a white wing patch and a grey, chisel-like beak. Males have a crimson head and crest. above the ground. Females lay 1-4 eggs. 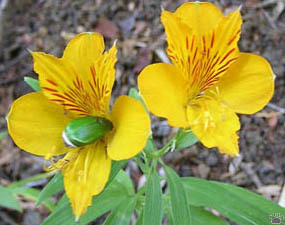 The most famous flowers of Chile include 12 species of Calceolaria (left) and 35 species of Alstroermia (right, with Brachysternus beetle). Isla Chiloe. species of shrubs, lianas and herbs, and the geographic range extends from Patagonia to central Mexico, with its distribution centre in Andean region. 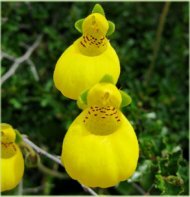 Calceolaria in Latin means shoemaker. 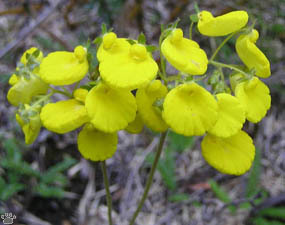 Calceolarias have usually yellow or orange flowers, which can have red or purple spots. growing. All are long-lived perennials except A. (Taltalia) graminea, a diminutive annual from the Atacama Desert of Chile. Many parts of the region have never been explored thoroughly. it's probably the remote valleys of Southern Chile. Cold-resistant dinosaurs have lived there in the past; other "living fossils" are still present. 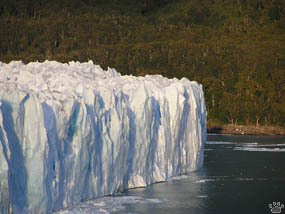 Edge of Perito Moreno Glacier forms a tiny ice shelf.